My purpose of coming to Thailand was initially as an economics exchange student at Thammasat University for one semester. During my time here, I was also looking to pursue something professionally, whether it was through a volunteering opportunity or internship. Coming from the University of Washington in Seattle, I was able to get contact with Dr. Yot through my supervisor Dr. Carol Levin, the director of the Global Health Cost Consortium. Dr. Levin suggested HITAP as it seemed like a perfect fit for my interests and studies, an intersection between science and economics. From my first day at HITAP, I was drawn in by how meaningful the work HITAP does to influence policy-making. I was invited to join in for a meeting with Sarah Garner, a coordinator of the World Health Organization, which introduced HITAP’s work domestically and internationally. I was also enlightened with Thailand’s Universal Health Coverage Scheme, as well as the use of health technology assessment (HTA) in coverage decisions in Thailand. Because the US does not have a centralized healthcare system, it was interesting to observe what occurs behind the scenes of a universal healthcare system. Along with the technical knowledge, I also enjoyed the culture and work environment of HITAP. It was primarily centered around meetings, and autonomous work. The projects I was offered and kept up with were extremely interesting and rewarding. My work mainly focused on GEAR, a tool for aiding health economists in LMICs. I appreciated how the nature of the work was so open-ended; I was able to create a project based on what I was interested in. 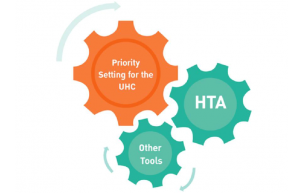 For instance, I researched and wrote on the HTA toolkit, costing analysis, as well as begun a longer-term project comparing HTA processes in different countries. While the open-endedness of the work was very rewarding, it was also one of the biggest challenges for me. A lot of reading was done in order to first understand GEAR, the context of HITAP and the concepts behind HTA. Without a set structure, it was difficult to absorb all the information at once. Nevertheless, my mentor Alia was very accessible and responsive to answering my questions and providing feedback to my work. As sad as I am to leave Thailand, I am grateful for the opportunity to pursue an internship here and for everything I learned. I would like to give a big thank you to Alia for her patience in answering my never-ending questions, Dr. Yot for the opportunity, and the rest of the staff at HITAP for welcoming me on.